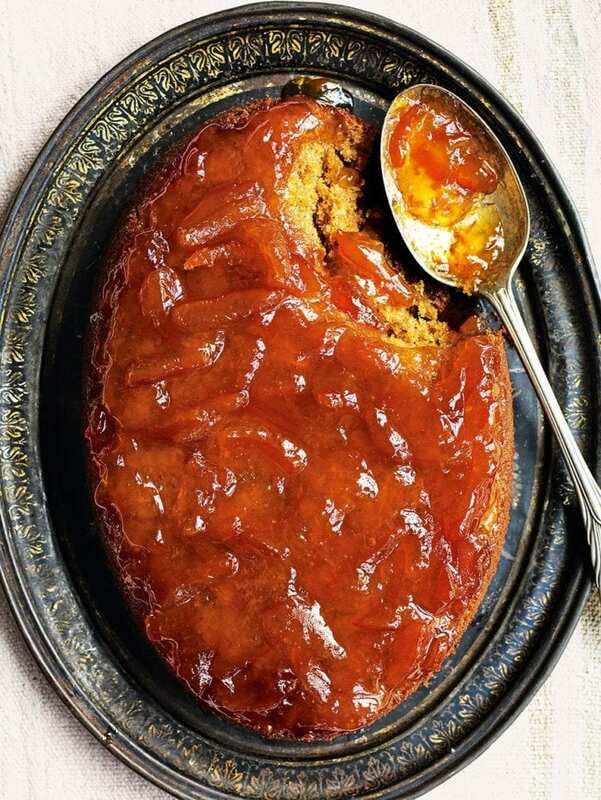 Debbie Major’s marmalade and ginger upside-down pudding recipe makes for a warming winter dessert to serve with lashings of custard or pouring cream. Heat the oven to 180°C/fan160°C/gas 4. Grease a 1.2 litre shallow, oval or round baking dish and line the base with a piece of crumpled and slightly damp baking paper. Warm the 175g marmalade gently in a pan, then pour into the dish and spread out evenly. Leave to cool. For the sponge mixture, sift the flour, spices, a pinch of salt and baking powder into a bowl. Beat the butter in another large mixing bowl until pale and fluffy using an electric hand mixer. Add the sugar and beat for 5 minutes until paler in colour, then beat in the eggs one at a time, adding 1 tbsp of the flour mixture with the second egg. Beat in the grated ginger. Gently fold in the remaining flour mixture with a metal spoon, followed by the orange juice. Carefully spoon the mixture into the dish and spread it out evenly, making sure it touches the sides. Bake for 30-35 minutes until risen and a skewer pushed into the centre comes away clean. Leave the pudding to cool in the dish for 10 minutes, then run a knife around the edge and carefully turn it out onto a warmed serving plate. Warm the 2 tbsp marmalade, pour on top of the pudding and spread it out evenly to the edges. Serve with custard or cream. Peel ginger by scraping the skin away with a teaspoon a knife can be wasteful). Make up to 2 days ahead. Keep covered in the fridge, then warm in a 180°C/fan160°C/gas 4 oven for 10-15 minutes. Freeze the finished dish for 1 month, defrost and heat as above.